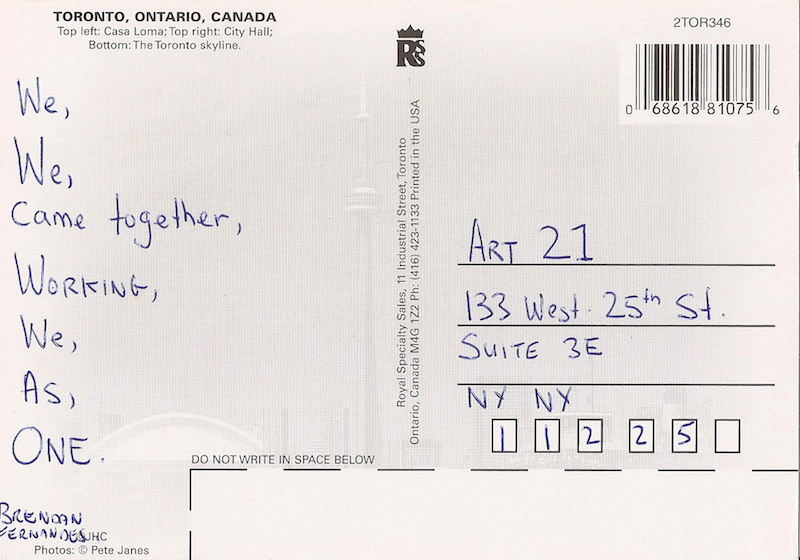 “Postcards” is a new magazine project that asks select contemporary artists living or working outside of the United States to mail us a postcard, which is then scanned and published online. Brendan Fernandes, who lives between Toronto and New York City, inaugurates the project. Brendan Fernandes (b. 1979, Nairobi, Kenya) examines issues of cultural displacement and migration through installations, video, sculpture, and dance. Fernandes was recently in Toronto for the city’s annual nighttime art event, Nuit Blanche, where he debuted Night Shift (2013), a twelve-hour durational performance created in collaboration with choreographer Michael Trent and Dancemakers. Night Shift was inspired by Le Ballet de la Nuit, a court ballet initiated by Louis XIV of France who cast himself in the role of Sun King. In Fernandes’s version, sixteen dancers performed from dusk until dawn, all the while making gold confetti with paper shredders and thus raising questions about labor and endurance. At dawn, dancers and audience members tossed the confetti into the air in celebration of the new day. Photographs and video of the performance are included in the CCCA Canadian Art Database.